Random images from summer '05. The boys and cousin Zoe visit a playground near Yiayia's house. The boys have some fun in the pool. The boys have some fun in the snow. It's nice to walk through, but is it art? Dancing around at Jimmy's birthday. The boys & Zoe play around. An Autumn visit from Pappou and Yiayia. Summer in NY Horsing around at home. Lazy, Crazy Days of Summer. Luke & Alex's cousin Zoe's Web site. MAINE, August, 2005 - Our boys have some fun on their visit to Maine, where life's a beach. To view photos, click here. August, 2005 - The boys fly kites, check out some trolleys, visit the zoo, and generally have a good old summertime. NEW YORK, July-August, 2005 - Spending some quality time around the house with family and friends from near and far - and they're pretty good at amusing themselves on their own, too. NEW YORK, July, 2005 - A random collage of images from home... In other words, the boys, just playing around and enjoying the Summer of '05..
HARRISBURG, PA, July 10, 2005 - On this hot, hot, hot summer day, Zoe, Loucas, and Alex slide, swing, and climb their way through a playground near Yiayia's house..
BRYN MAWR, PA, July 4, 2005 - There's nothing like a swimming pool on a hot summer weekend... as the boys found at hanging out at Thea Anna's house for the Independence Day holiday. 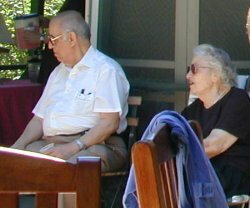 NEW YORK, July 2005 - It's been about a year since we last updated this site - a difficult year during which our family has lost two cherished members: the boys' Pappou and their Big Yiayia. 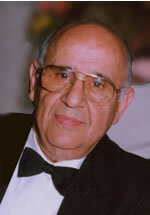 Pappou passed away on October 14, 2004 in Harrisburg, PA. Big Yiayia passed away on May 25, 2005 in Bryn Mawr, PA.
Loucas Constantine Tzanis, beloved husband, father, and grandfather. 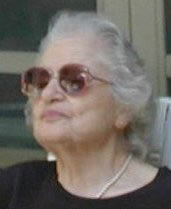 Despina J. Apostolos, beloved mother of 2, grandmother of 7, and great- grandmother of 9. NEW YORK, March 2005 - Snow days can certainly be "heavenly" — especially when you have little cherubs like these making snow angels in the park with Mom. NEW YORK, February 2005 - It might be fun to play there on a grey February afternoon, but is it Art? The boys pondered this and other questions as they explored Christo's exhibit in the park. boys at the Gates, click here. HARRISBURG, PA, February 2005 - When Yiayia and Maria hire a bellydancer as a suprise for Jimmy's birthday, the boys also try to get into the act. HARRISBURG, PA , January 2005 - The boys and their cousin Zoe spend some time fooling around at Yiayia's house. NEW YORK, February 2005 - The boys and their cousin Zoe play with trains ... both big and small. NEW YORK, December 2004 - Thea Chrisanthi and Yiayia drop in to see the boys just before Christmas. NEW YORK, Semptember 11, 2004 - The boys were lucky enough to have one last visit from Pappou on this beautiful Autumn weekend. NEW YORK, July 23, 2004 - Whether just horsing around the playpen or amusing family and friends, the boys always know how to enjoy a summer evening.